‘Natural selection’ is often referred to as ‘survival of the fittest’ or, more recently, ‘reproduction of the fittest’. Many people are confused about it, thinking that evidence for natural selection is automatically evidence for the idea that molecules turned into microbes, which became millipedes, magnolias and managing directors. Most presentations of evolution add to the confusion by conveniently failing to point out that even according to evolutionary theory, this cannot be true; natural selection by itself makes no new things. A greater chance of survival. I.e. the organism is ‘more fit to survive’. This is what ‘survival of the fittest’ means, by the way; it does not necessarily refer to physical fitness as commonly understood. If you are more (or less) likely to survive, you are correspondingly more (or less) likely to have offspring, and thus to pass your genes on. For instance, genes for longer hair will improve an animal’s chances of surviving in a cold climate. Genes for white colouring will improve the camouflage of a bear in a snowy wilderness (camouflage does not just help an animal avoid being caught and eaten; it can also help a predator to sneak up on prey). By thus being more likely to avoid starvation, a lighter-coloured bear is more likely to be around to pass its lighter colouring on to the next generation. A greater chance of finding a mate. If the females of a fish species habitually prefer mates with longer tails, then male fish with genes for longer tails will have more chance of reproducing, on average, so that their genes (which include those for long tails) have more chance of getting copied. The long-tail genes (and thus the long-tail variety) will therefore become more common in that population. Any other way of enhancing reproductive success. Consider a plant species, the seeds of which are dispersed by wind. If it has genes which give its seeds a shape that confers on them slightly better aerodynamic ‘lift’ than the seeds of its fellows, then the genes for that particular trait (and thus the trait itself) will be favoured, i.e. ‘selected’ in this ‘natural’ way, hence the term. Conversely, if that plant species happens to be on a small island, seeds which travel far are going to be more likely to be ‘lost at sea’. Hence genes which give less ‘lift’ will be favoured. Presuming that genes for both short-distance and long-distance seed air travel were available, this simple effect would ensure that all the members of an island population of such plants would eventually produce only ‘short-flight’ seeds; genes for ‘long-flight’ seeds would have been eliminated. 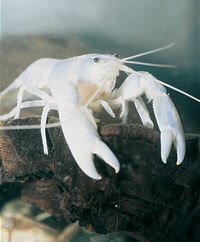 In such a way, creatures can become more adapted (better suited) to the environment in which they find themselves. Say a population of plants has a mix of genes for the length of its roots. 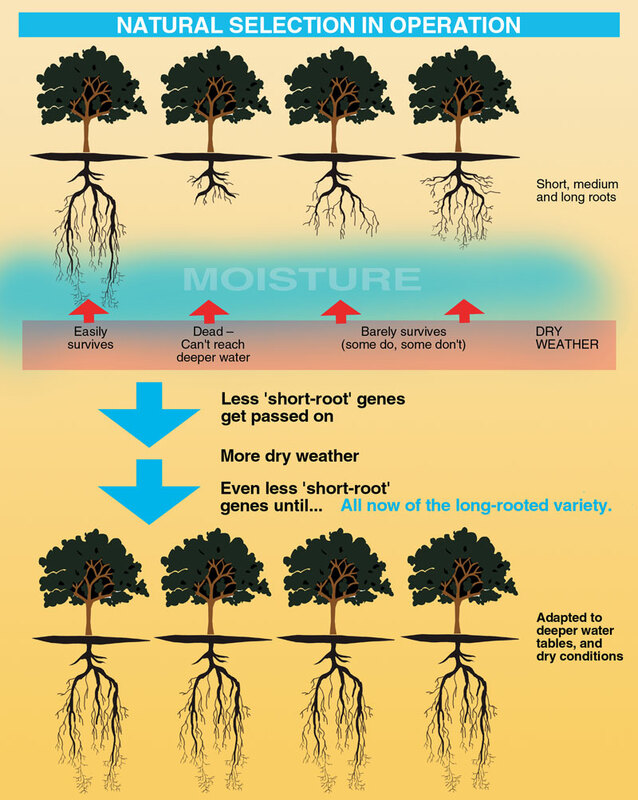 Expose that population over generations to repeated spells of very dry weather, and the plants most likely to survive are the ones which have longer roots to get down to deeper water tables. 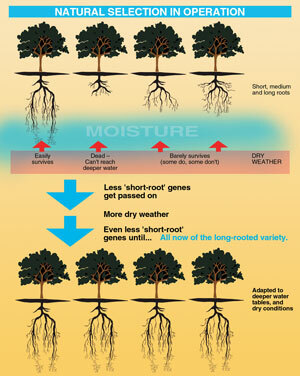 Thus, the genes for shorter roots are less likely to get passed on (see diagram above). In time, none of these plants will any longer have genes for short roots, so they will be of the ‘long root’ type. They are now better adapted to dry conditions than their forebears were. This adaptation, really a ‘fine-tuning to the environment’, was seen by Darwin to be a process which was essentially creative, and virtually without limits. If ‘new’ varieties could arise in a short time to suit their environment, then given enough time, any number of new characteristics, to the extent of totally new creatures, could appear. This was how, he believed, lungs originally arose in a lungless world, and feathers in a featherless one. Darwin did not know how heredity really works, but people today should know better. He did not know, for instance, that what is passed on in reproduction is essentially a whole lot of parcels of information (genes), or coded instructions. It cannot be stressed enough that what natural selection actually does is get rid of information. It is not capable of creating anything new, by definition. In the above example, the plants became better able to survive dry weather because of the elimination of certain genes; i.e. they lost a portion of the information which their ancestors had. The information for the longer roots was already in the parent population; natural selection caused nothing new to arise in, or be added to, the population. The price paid for adaptation, or specialization, is always the permanent loss of some of the information in that group of organisms. If the environment were changed back so that shorter roots were the only way for plants to survive, the information for these would not magically ‘reappear’; the population would no longer be able to adapt in this direction. 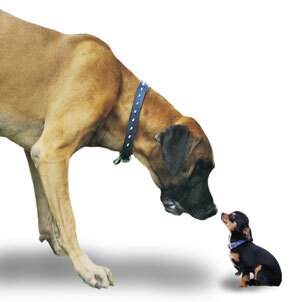 The only way for a short-rooted variety to arise as an adaptation to the environment would be if things began once more with the ‘mixed’ or ‘mongrel’ parent population, in which both types of genes were present. In such an information-losing process, there is automatically a limit to variation, as gene pools cannot keep on losing their information indefinitely. This can be seen in breeding, which is just another version of (in this case, artificial) selection—the principle is exactly the same as natural selection. Take horses. People have been able to breed all sorts of varieties from wild horses—big working horses, miniature toy ponies, and so on. But limits are soon reached, because selection can only work on what is already there. You can breed for horse varieties with white coats, brown coats and so forth, but no amount of breeding selection will ever generate a green-haired horse variety—the information for green hair does not exist in the horse population. Limits to variation also come about because each of the varieties of horse carries less information than the ‘wild’ type from which it descended. Common sense confirms that you cannot start with little Shetland ponies and try to select for Clydesdale draft horses—the information just isn’t there anymore! 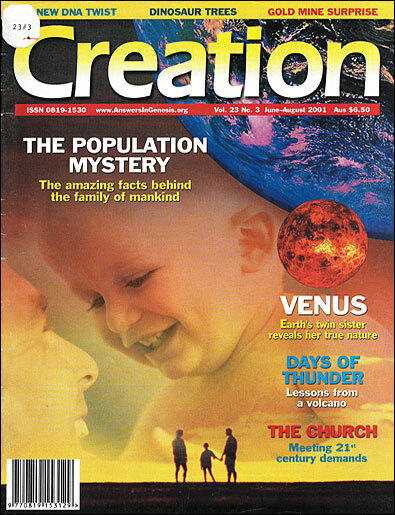 The greater the specialization (or ‘adaptation’, in this case to the demands of the human breeder, who represents the ‘environment’), the more one can be sure that the gene pool has been extensively ‘thinned out’ or depleted, and the less future variation is possible starting from such stock. These obvious, logical facts make it clear that natural selection is a far cry from the creative, ‘uphill’, limitless process imagined by Darwin (and many of today’s lay-folk, beguiled by sloppy public education). Evolutionist theoreticians know this, of course. They know that they must rely on some other process to create the required new information, because the evolution story demands it. Once upon a time, it says, there was a world of living creatures with no lungs. Then the information for lungs somehow arose, but feathers were nowhere in the world—later these arose too. But the bottom line is that natural selection, by itself, is powerless to create. It is a process of ‘culling’, of choosing between several things which must first be in existence. From Life and Letters of Charles Darwin, D. Appleton and Co., London, 2:400, footnote, 1911. 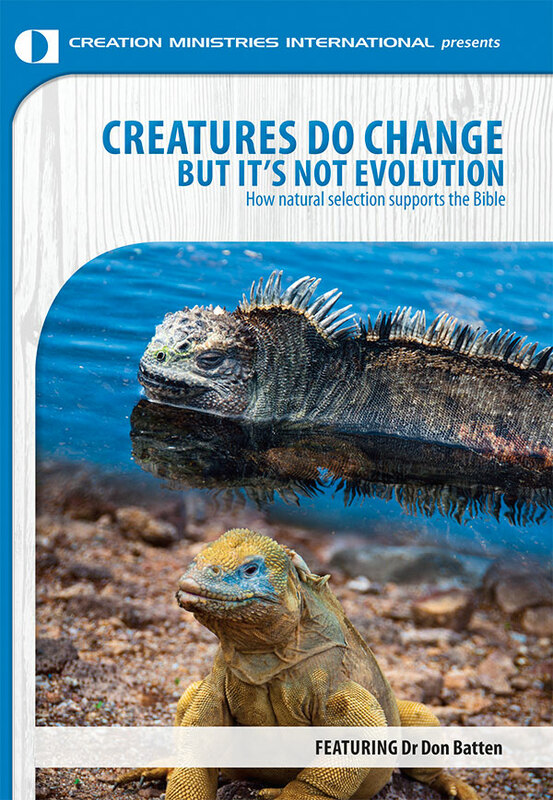 How do evolutionists explain new information? Natural selection adds no information, in fact it reduces it. Evolution requires a way to add new information. Mutations (genetic copying mistakes) must be invoked to explain how new information arose in order for natural selection to ‘guide’ the assumed evolutionary process. It is thus quite illegitimate to use instances in which natural selection is happening (reducing the information in populations) as examples of ‘evolution happening’. 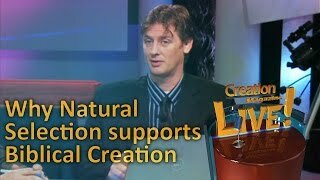 Natural selection, operating on the created information in the original gene pools, makes good sense in a fallen world. It can fine-tune the way in which organisms ‘fit’ their environment, and help stave off extinction in a cursed, dying world. By ‘splitting’ a large gene pool into smaller ones, it can add to the amount of observed variety within the descendants of an original kind, just as with the many varieties of horse from one type. Even new ‘species’ can come about like that, but no new information. This helps to explain greater diversity today than on board the Ark. Perhaps if evolution’s ‘true believers’ really had convincing evidence of a creative process, they would not feel obliged to muddy the waters so often by presenting this ‘downhill’ process (natural selection) as if it demonstrated their belief in the ultimate ‘uphill’ climb—molecules-to-man evolution. We need to tell this increasingly educated world how the facts about biological change connect to the real history of the world from the Bible, to help them understand and believe the Gospel message that is firmly based upon this real history. Obviously, a mutation (genetic copying mistake) causing blindness in a shrimp living in the light would normally hinder its ability to survive. However, it would not be a handicap where there was no light, and as a side benefit, the shrimp would not be susceptible to eye infections like its still-seeing relatives. This slight advantage is enough to ensure that, after a few dozens of generations, all the shrimps will carry the defective gene, and thus will all be blind. They have not in fact evolved any abilities, they have lost one. A loss can be a survival advantage, but it is still a loss. The evolutionary belief demands that massive amounts of new information have arisen over time; showing how information is lost or corrupted can scarcely be said to support this belief. 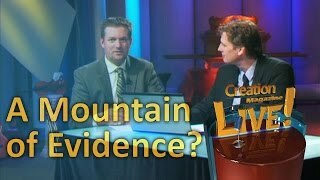 A 'mountain of evidence' for evolution? Taylor, I., In the Minds of Men, TFE Publishing, Toronto, Canada, pp. 125–133, 1984. Return to text. From a Frog to a Prince video, produced by Keziah. See also Spetner, L.S., Not by chance!, The Judaica Press Inc., New York, 1998. Return to text. Gitt, W., In the beginning was information, Christliche Literatur-Verbreitung, Germany, p. 79, 1997. Return to text. Wieland, C., Beetle bloopers, Creation 19(3):30, 1997. Return to text. Footnote added July 2010: Since this article was written, there have been less instances proposed than the fingers of one hand—and some of them not at all straightforward examples, like the bacteria that can now digest nylon. There are thousands of mutations known and studied—for the neoDarwinian mechanism to be credible, there would need to be hundreds one could point to in papers everywhere, yet they are still virtually non-existent, even though it is conceivable that in a very rare instance, a random change could add a tiny bit of information (specified complexity) for natural selection to work on. Return to text.